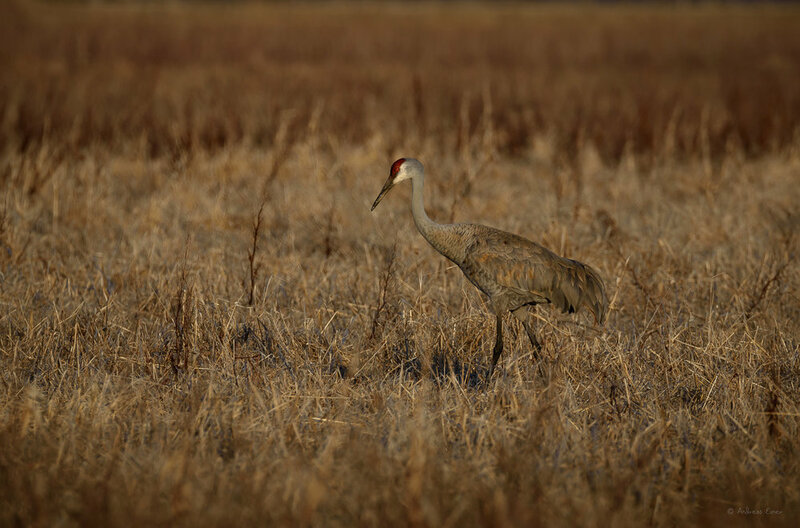 Any time I go to the Green Island Wetlands in spring I see or at least hear some Sandhill Cranes. Two years ago we had about 200 cranes but this year I have not seen more than 20 at a given time. Getting close to them can be a challenge. They are not skittish, like for example most of the ducks, but they keep a distance to humans and cars that doesn’t always allow to make a decent photo of these birds. Last Sunday I was lucky and came close to a single pair that was searching for food. I didn’t get both cranes in the same frame but was nevertheless pretty happy about the results. Getting close is key for a sharp image. In this habitat, between the old grass and reeds, the Sandhill Cranes do not provide a lot of contrast to lock on focus all the time. The ground is still cold and the warmed up air above can lead to heat shimmer and make obtaining focus even more difficult. Going out late in the day, when the temperatures drop and the light gets warmer seems to be the best time for success.